There are some arguments worth having. We're about to have a general election in the UK and while it is likely that the Conservative Party will remain in place, it is worth arguing for every vote against them. Politicians and political parties are at their most dangerous when they feel safe and unopposed. This argument is worth having because many people have not made up their minds yet and others may be thinking one way but could be talked around. In recent weeks, I've been frustrated with those who share my approximate politics but seem to have lived their entire lives in communities where everyone votes in the same way, allowing them to imagine and then declare that people who vote Conservative are universally wealthy, self-interested and prejudiced in all variety of ways. If this were the case, political arguments would be pointless. As it is not the case, such rhetoric risks pushing folk off the fence in the wrong direction. Some political arguments are not worth having. Some people have such extreme and hateful opinions that talking to them about politics is not only pointless, but can only feed their thirst for attention and power over others. If such a group of people were about to take power on June 8th, our strategy would need to be very different. As it is, there's a possibility we can still win this one, or at least minimise the damage. So I thought of everyone I've ever known who admitted to considering a vote for the Conservatives and (having eliminated the ones who fancied John Major or wanted revenge on their socialist father) I compiled the following reasons a decent person might mistakenly vote Conservative. I've known builders and hair-dressers who have always voted Conservative because of this idea that a Conservative government will work in the interest of the self-employed. I've known Christians (who have not all been middle class and white) who have always voted Conservative because of this idea that a Conservative government will support roughly “Christian” values (I've put this in inverted commas because most Christians I know care very much more about child poverty or the plight of displaced people than they do about tax breaks for married people. However, they still might vote Conservative depending on how they understand such issues.). Where I live in rural East Anglia, voting Conservative used to be a mandatory condition of employment; once working men got the vote, any suspicion or rumour that you were going to use your vote otherwise would lose your job with the lord or landowner. Most local people worked for the lord or landowner. Left-wing city-dwellers sometimes imagine that safely blue rural seats like mine are populated by tweed-addled gentry or commuting investment bankers – that we don't have a housing crisis, foodbanks and the rest – but the reality is that generations had no choice about who to vote for (it is still perfectly legal to fire someone for their political affiliations on the UK mainland) and our local identity as Conservative-voters kind of stuck. Even today, the most prominent political campaigning I see are the big Conservative billboards erected in fields by the road. People who own fields still hold a lot of political power in rural areas. Conservative Governments tend to look out for people who own fields – green, brown and otherwise. 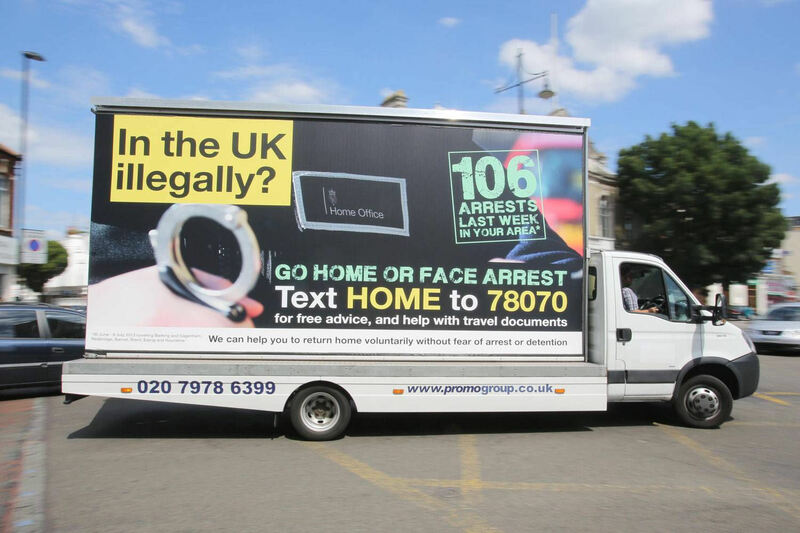 Since 2010, the Conservative government have stirred up and exploited fears about immigration, writing new laws which split families apart and more recently, hare holding EU migrants, upon which our communities, public services and economy depend, to ransom. Oh and now there's Empire 2.0. This government's treatment of disabled people has been so appalling that the UK has been condemned by the UN. 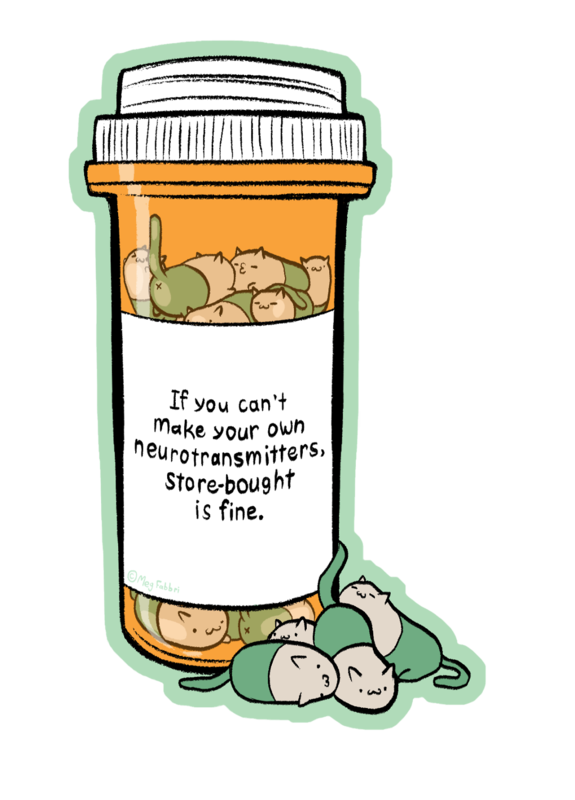 The demonisation, interference and deprivation some of us have experienced has been fascistic in nature, but even so, we are not living under a fascist regime. There's a huge difference in a government which does this stuff under the guise of "security" or "austerity" and a government whose leader makes explicitly racist remarks, hangs out with unashamed white supremacists or mocks disabled people to the cheers of their supporters (if prominent Tories have done any of those things, even I am unaware of it). If I was a US American, I would struggle with the knowledge that any friend, family member or neighbour of mine had voted for someone who repeatedly spoke of people like me with utter contempt and promised to remove the free medical care upon which my life depends. When I meet folks who admit they voted Conservative, I assume (usually correctly) that they don't know the first thing about Welfare Reform and haven't heard of Yarl's Wood. People who vote Conservative don't have to be racist and they don't have to hate disabled or poor people. If everyone was equally and thoroughly informed about politics, it would be a different matter - what's happening is wrong, lives are at stake and everyone who knows about it has a duty to do the bare minimum by voting against it. But not everyone knows about it or understand things the same way. 3. Some folk are much more comfortable with the idea that people are rewarded for wrong-doing than the idea that innocent people are punished. In conversations with non-disabled people (and even the odd disabled person) about the damage caused by benefit and social care cuts and the rhetoric surrounding them, I have never heard that disabled people deserve to be demonised. Instead, I hear that disability fraud is endemic and while of course “genuine” disabled people – people like me – deserve much better treatment, the blame lies firmly at the door of people who have been exploiting the system. The governments own stats put this fraud at around 0.7%. Of course some people do genuinely hate disabled people. But far more common is the hatred of an imagined mass of non-disabled people who are exploiting a system designed to support disabled people. People believe in that and of course, fraudsters – though rare - do exist and are often frustratingly conspicuous. In the same vein, some people believe we should halt all immigration, but more common is the belief in significant numbers of benefit tourists or criminal gangs trying to get here because we're a “soft touch”. We're sitting on our hands during the greatest refugee crisis of a generation, but "genuine" cases (that word again) would be welcome if it wasn't for so many villains knocking on the door. There is a bit of a chasm between people who tend to get involved in social justice and those that don't. Those of us actively involved (however modestly) in trying to make the world a fairer place know how extremely unfair it is already. And that hurts – usually, it has hurt us personally and deeply. However, it is very difficult to effectively communicate these ideas with people who are not yet prepared to accept that many of life's misfortunes are not pure bad luck, but the work of prejudiced, power-hungry, uncaring or malicious people. It's not that those of us who see this are looking at a bleak world, but merely a world which requires work and self-awareness. Hordes of limping fraudsters and Romanian ATM-robbers may be easier to stomach. 4. The big problems in the country are invisible to many people. 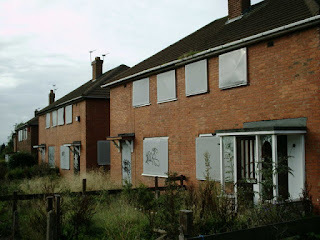 There are currently 75,000 families (consisting of at least one parent and at least one child) living in temporary accommodation in the UK – that's B&Bs, and not the sort like that nice cottagey place in the Cotswolds with too many doilies. 75,000 families is a lot of people. It's a scandal. But there are 65 million people in the UK, so there's no guarantee that you know any of them (or that they would let you know how they were living if you did). There are more empty houses than homeless families. There is planning permission for thousands of more houses and developers who have promised to build them. However, there is an awful lot of private money to be made out of house prices and rents that most people can barely afford and some can't afford at all. It costs the state a fortune to keep a family in even the crappiest guest house, but this particular government favours the interests of the very rich (on account of them being very rich people themselves). I use this example, because it was something I only learned about a few months ago. I knew quite a lot about other aspects of the housing crisis, but had no idea so many families were homeless just now because I don't think I know any of those families. I would guess that most people don't know the difference between ESA, PIP or universal credit (several politicians are muddled on the subject). I have heard people speak with absolute bewilderment as to how anyone might need a foodbank because they've been poor or unemployed and they never did. Folk just don't know the scale of what has been happening in the country because it is extremely bad on a relatively small scale. We don't have very visible problems such as high unemployment. However, to be unemployed right now is to live far more precariously than it was ten, twenty or thirty years ago. 5. The media is biased (but it is not a conspiracy). The media is made of a diverse group of people, mostly employed by wealthy individuals motivated primarily (though not exclusively) by money. Money is made by selling newspapers, attracting clicks or viewers and so forth. The people who own large media corporations tend to (not always or exclusively) prefer right-wing governments because they (a) look after rich people (b) tend to (not always or exclusively) create economic and social instability, which in turn creates dramatic headlines, which in turn sells copy. This is not a conspiracy – this is capitalism. was everywhere. It's an improvement, isn't it? Even organisations like the BBC, who are very heavily obliged to be politically impartial can never present a truly balanced view of events as they unfold. The need to present “balance” occasionally winds up with a guest campaigning against drink-driving contrasted with another guest who thinks he's a better driver after he's had a few. And of course, they too need clicks and ratings, which conflict and controversy drive along (thus, for example, the endless appearance of Nigel Farage, who was repeatedly rejected as an MP and whose party's parliamentary power peaked at a single seat, now lost). Not only do we mere mortals forget all this, but we simply don't have the time or energy to consider the way every story we hear or read is being told. I am extremely interested in this stuff – I love both statistics and story-telling, and am both fascinated and appalled by the way these are combined to present the most sensational possible news. However, even I get tricked about subjects I'm not especially invested in. 6. Misinformation happens easily and quickly even without manipulation and “fake news”. One day, a few years back, a stranger came to the door raising money for the local Air Ambulance. They explained that the Air Ambulance received no state funding as our government preferred to spend our taxes on putting Indians in space. This was one of those remarks where you're not sure quite what's going on in a conversation, but it feels like you probably want out. 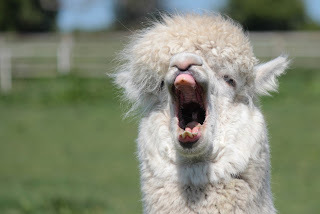 I can't stand up for long anyway, so I said as much and promised to look the charity up on-line. I didn't disbelieve my friend, but I turned to Google anyway. The story was from three or four years earlier, when the government froze levels of foreign aid to India. However, there was an argument made at the time (by Philip Davies MP, incidentally) that we shouldn't give any aid money to a country which is rich enough to have its own space programme. This BBC article explains some of the complexities within foreign aid. Absolutely no UK money has ever been used in the (modest) Indian space programme. Most people don't buy newspapers. There's some evidence that even when people link to a story on Twitter or Facebook, they often don't actually read the story. In any case, most of us consume most of our news in small snippets – in headlines, in tweets, in the first few minutes of TV news, in the on-the-hour bulletins on radio and in disjointed conversations. It's not people's fault when they end up with the wrong end of the stick, especially when it confirms pre-existing prejudices. This is why it is always important to talk to folk about what's going on in the world. Human beings are extremely social, and we wield an awful lot of power over one another. Arguing directly “You're wrong about this!” is often hopeless, but telling stories, telling our own stories and experiences or discussing subjects we know well can help prise open folks' eyes. 7. Lots of people vote local at General Elections. If you're not especially interested in national politics (and goodness me, I'm not interested – it just effects me and those I care about too profoundly to ignore it), but your sitting MP helped out your uncle with a boundary issue or put in a good word for your friend when they lost their benefit (because some Conservative MPs seem to really care about their constituents in crisis, even if their own voting choices have caused the trouble), then you're going to vote for that guy rather than a stranger you know nothing about. 8. It's could be worse. Remember after David Cameron resigned last summer? I wanted Theresa May to be prime minister. I remembered this was the lady who confused a man'spartner and his pet cat with the words “You can't make it up!” (she just did). But remember our other prospects? Boris Johnson, Michael Gove, Andrea Leadsom. Theresa May was by far the best of a very bad bunch. Of course, it's not impossible the Conservatives stay in Government but May loses her seat... best not think about that. Things do not feel very stable just now, and even though May and her colleagues are demonstrably part of that instability, the entire general election campaign is based on the idea that the Conservatives under May somehow are “strong and stable” in comparison with other options. If people's quality of life has not deteriorated (and it hasn't for many people, even while it has plummeted for some) but they feel nervous for the future, they're likely inclined to vote for the status quo. Even though of course, we're about to leave the EU – the status quo is completely and utterly off the table. 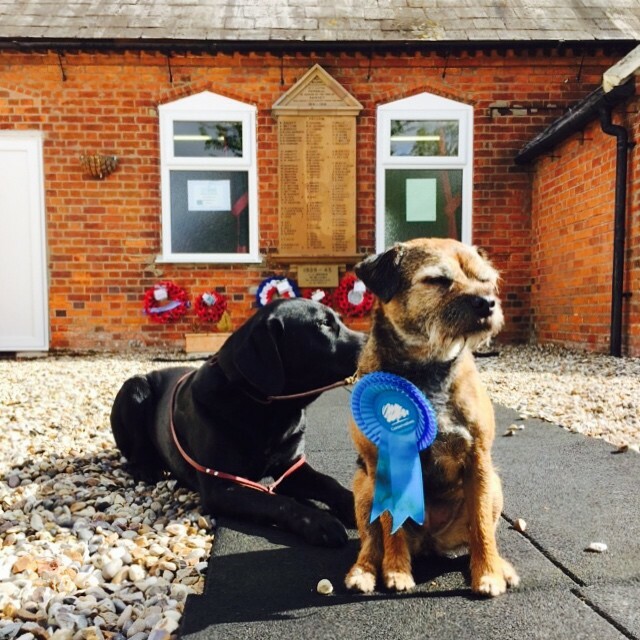 The first image is a photograph of two dogs outside a polling station. The most prominent dog is a small terrier who is wearing a blue rosette. Behind them sits a black dog whose type I couldn't identify. This image was found on Flickr, belongs to Ashley Coates and is used under a Creative Common's License. The second image is a photograph of a scarecrow in a field. 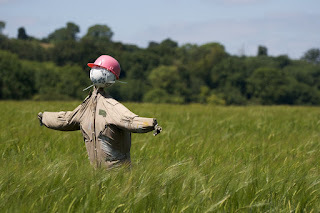 The scarecrow wears a hardhat and long grass or cereal comes up to its waste. This image was found on Flickr, belongs to Peter Pearson and is used under a Creative Common's License. 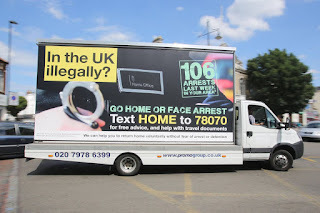 The third image is a photograph of a van on the side of which it reads "In the UK illegally? Go home or face arrest" and there follows details or who to contact. 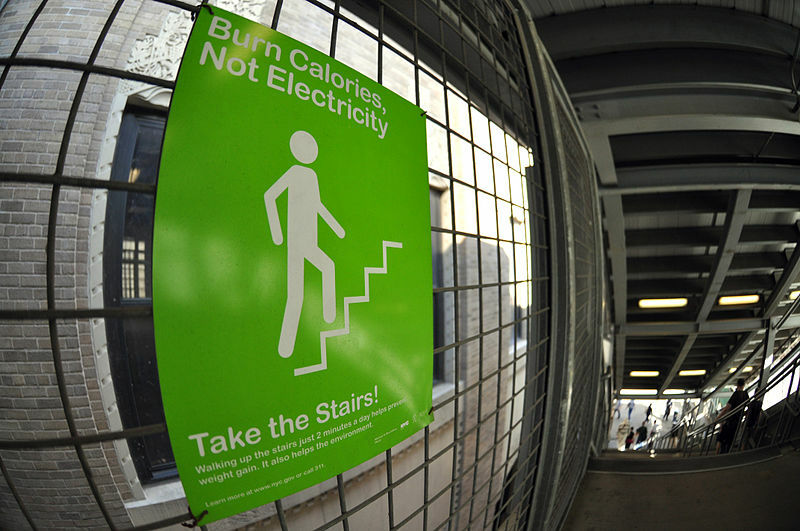 This image was found on Flickr, belongs to Ian Burt and is used under a Creative Common's License. 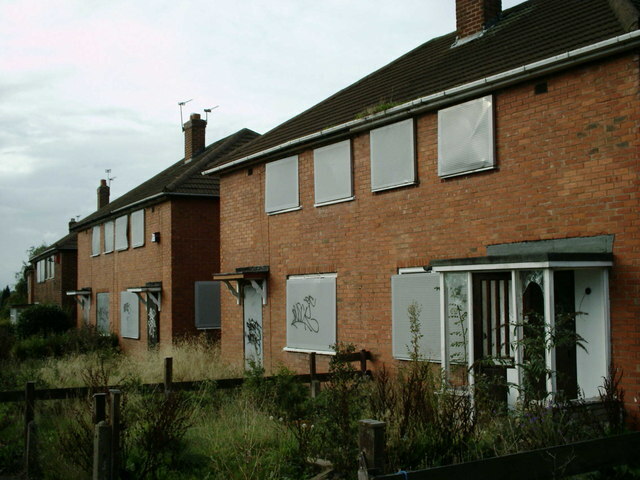 The forth image is a photograph of a terrace of houses where the windows and doors have been boarded up and the front gardens left to become overgrown. This image was found on geograph, belongs to Carl Baker and is used under a Creative Common's License. 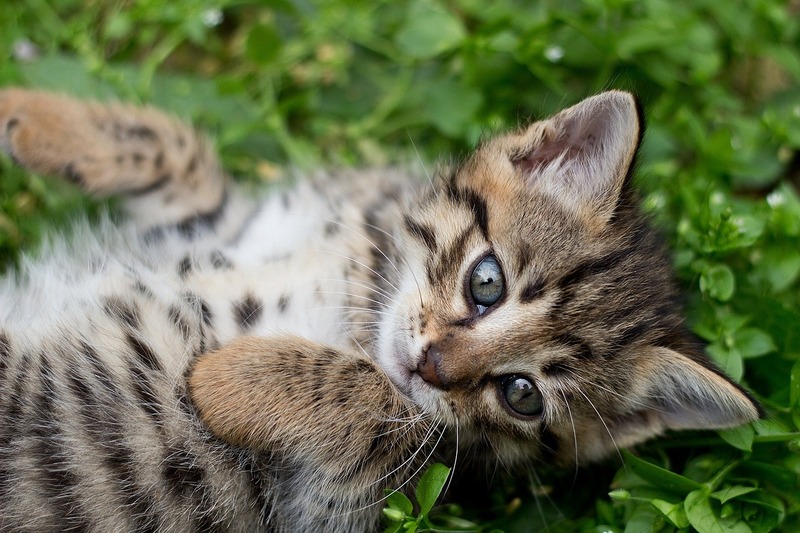 The fifth image is a photograph of a tabby kitten rolling on its back while gazing at the camera. This image was found on Pixebay, is by EugenieM and is in the public domain.